With an exciting world of contemporary art bubbling under its surface, Bali is much more than just a popular vacation spot. I didn’t get a lot of sympathy when I recently told people I was going on a business trip to Bali. After all, Bali on business didn’t sound like such a bad gig—I might have to work but what could be wrong with a trip to paradise? But my schedule was packed with appointments with the Bali-based artists we work with, and I also had plans to meet some new ones, along with a few gallery owners. It’s my general modus operandi in any city I visit, but it was tougher in Bali than other places because everyone around me was partying, surfing and tanning. It was a peaceful relaxing time, much like the works themselves. After we finished our drinks, we headed off to the studio of another artist on my list: Ida Bagus Putu Purwa, whom I will write about next week. 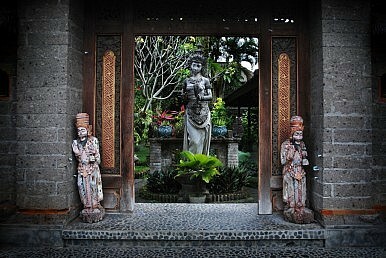 Bali may look like an art town, but most of Indonesia’s top artists actually come from another place: Jogjakarta.